So as I’m driving in to work this morning I hear on the that the Cash for Clunkers program I recently posted about is now basically bankrupt! I guess a lot of people thought it was a good deal. I wonder if this means that auto dealers and companies will be reporting record profits soon…. So, apparently today the government has a program that will let you get a cash rebate if you trade in an old car for one that is newer and gets better gas mileage, up to $4,500 in some cases. 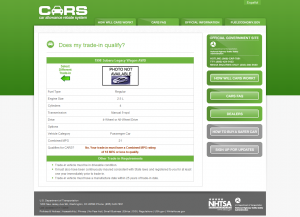 A free $4,500 towards the purchase of a new car is nothing to sneeze at so I went to the website to see if my car qualified for a trade in. Apparently your car needs to be made within the last 25 years (since 1984) and its combined fuel economy needs to be 18 mpg or less. 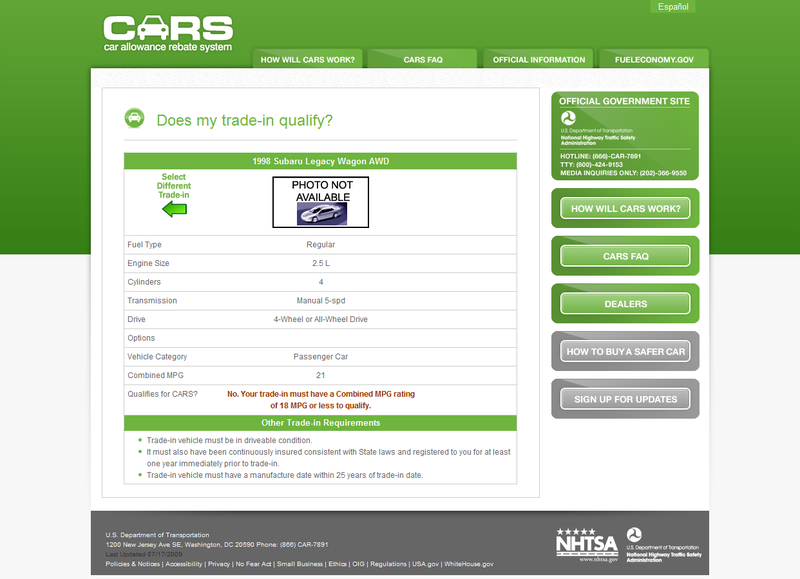 My car passes the first test, it is a 1998 model, however, it just barely fails the second test. My combined fuel economy is listed as 21 mpg (this is the average between city and highway). So, basically, if I want to get a car with better fuel economy, I’m on my own. Oh well, it was a nice idea.